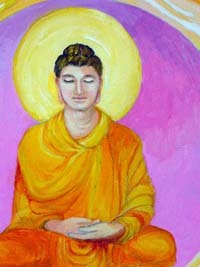 ¤ They make clear the differences between Vipassana (Insight) meditation and Samatha (Calmness) meditation. ¤ They provide ongoing feedback in an interactive and personal way. The maximum number of participants is five. ¤ They are not silent throughout. There is plenty of opportunity to ask questions. ¤ They are less intensive in approach. ¤ They assume that the participants’ life experiences that brought them to the course will be different and that each person is wonderfully unique. ¤ Whilst participants will be given a comprehensive explanation of basic Buddhist ritual, nobody is expected to participate in that ritual if he or she feels uncomfortable. ¤ The shrine room is air-conditioned and chairs are provided if preferred. Participants will be given a theoretical background to Samatha (Concentration) meditation and shown how it differs from Insight (Vipassana) meditation. They will be shown how meditation forms an integral part of 'Bhavana" mental development and how it relates the the Noble Eightfold Path. They will gradually be guided through exercises to improve their concentration and bare awareness "sati", including standing, walking, sitting and lying down exercises. There will also be feedback sessions (Sorb arom), Dhamma talks and discussions. 6,500 baht each for small group courses on scheduled dates. 6,000 Baht per person for a small group (2 – 6 people) at times arranged for you. 8,000 baht for a course set up for an individual outside the scheduled dates. The course book is 100 baht. * Applications in writing must be received by e-mail at least 5 days before the start of the course. * Instruction will be in English although meditation reports can be conducted either in Thai or in English. * Participants should be in good health and will normally be over 18 years old. * It is not necessary to be a Buddhist to attend but openness to Thai Buddhist culture is important. * Meditators should wear comfortable, conservative clothing in light colours (white is preferable). * The meditation room is air-conditioned, so you may need a sweater. * Coffee, tea and soft drinks are available. * There are many foodshops and coffee sellers within walking distace. A list of these is provided. reasonably priced hotels and hostels is available on request. Please email your answers to the following questions to dhamma.art@gmail.com at least 5 days before the starting date of the course you would like to attend. Please give brief details of any previous meditation experience.